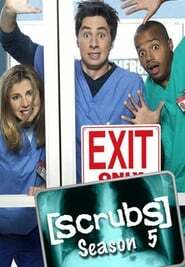 The fifth season of the American comedy-drama television series Scrubs premiered on NBC on January 3, 2006 and concluded on May 16, 2006 and consists of 24 episodes. For the first twelve episodes, two new episodes were broadcast back-to-back every Tuesday at 9:00 p.m. ET. Then NBC returned to broadcasting one new episode every week, followed by a rerun. For the first three weeks of this, the rerun episode was a cast favorite episode, with available audio commentary tracks on NBC’s website to accompany the episodes. Guest stars in the fifth included Jason Bateman and Mandy Moore, as well the introduction of new recurring characters played by Elizabeth Banks and Travis Schuldt. This season was nominated for the Primetime Emmy Award for Outstanding Comedy Series.